My skateboard is my commute companion. It gets me from home to the bus stop, and from the bus terminal in San Francisco to my day job – and then back again. It doesn't hurt that it actually makes commuting fun! But it is another thing that I need to haul around with me. And it's difficult enough to navigate crowded buses and trains with a backpack, much less a backpack and a skateboard. This is the problem MovPak, a Brazilian startup, hopes to solve with its first line of electric skateboards. Sure electric skateboards, bikes, scooters, and hoverboards are all over the place these days, but the MovPak is different. It's an electric skateboard that folds up and slides into an attached, usable backpack. The idea here is to provide commuters with a space-saving mode of transportation that you can take just about anywhere. I recently got the chance to try out a MovPak for myself at an event in San Francisco. And while I don't see myself exchanging my manually-powered skateboard for a MovPak any time soon, it's a clever concept that, for some commuters, could be truly useful. It's a backpack. It's a skateboard. It's...both? When folded out, the MovPak looks like an ordinary cruiser-style skateboard – except it has a backpack attached to its rear. At first glance, the MovPak does look a little odd, especially if you're more accustomed to the look of a standard skateboard. 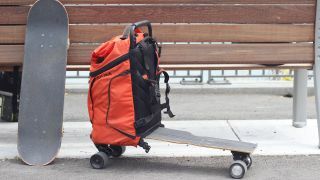 But fold the skateboard into the backpack, and it resembles an ordinary, wheeled commuter backpack, which is available in several different styles and sizes. Besides, if you're a grown adult riding an electric skateboard around town in 2016, you probably don't care what others think of you anyway. At 17 pounds by itself, the MovPak is as heavy as an overloaded backpack, but this backpack comes fully loaded. Inside, you'll find a charger for your phone, as well as a microphone and speakers so you can listen to music and talk to Siri or Google Now as you cruise. The bag also contains a compartment to stow away your tablet or laptop, and you can detach the bag from the skateboard and use it separately if you choose. Unsurprisingly, given its heft, I preferred using the backpack as a rolled bag as opposed to wearing it on my back. Although 17 pounds isn't terrible when you consider all that the MovPak can do, it's still heavier than other electric skateboards out there. Boosted's electric longboards top out at 15 pounds, while Acton's Blink board weighs nine pounds. I get why MovPak would want to cram this thing with features, but personally, I'd like to see MovPak offer a "light" option without some of these bells and whistles for those of us who like to pack as light as possible. Although I ride a standard skateboard nearly every day, I've never ridden an electric skateboard before I tried the MovPak. And let's just say that it takes some getting used to. Two electric motors power the MovPak, and you control its speed using a small wireless remote, as is the case with other electric skateboards out there. The company claims the board can travel for nine miles between charges, reaches speeds up to 20 miles per hour, and takes two hours to charge. Now for a little skateboard nerdery! The board itself feels like a fairly standard cruiser- or longboard-style deck – in other words, skateboards meant for riding around town. It's flat and flexible, without the concaves and curves you'll find on a trick skateboard. You can't ollie this thing, so don't even try. I found the MovPak's deck to be a little cramped compared to that of a standard skateboard, but if you've ever ridden a so-called mini-cruiser skateboard (such as a Penny board) its size shouldn't feel too foreign. The trucks – the axle-like assemblies on the bottom – are a little on the tight side, so you won't be able to turn too tight of corners, but the MovPak's creators tell me that you can loosen them some if you want to be more maneuverable. The wheels are big and soft, which should ensure a smoother ride. According to the company, skateboarders often have more trouble learning to ride the MovPak than non-skaters. And sure enough, it presented me with a bit of a learning curve. The recommended foot position is slightly different than what I'm accustomed to: you place your front foot at the very front of the board, facing forward, while you place your back foot sideways, right up against the bag. Riding a motorized skateboard also takes some getting used to: I wanted to push the board with my foot at first, and it took me a while to feel comfortable with controlling the board with a remote as opposed to directly with my body. But after a few minutes, I began to get a feel for how to handle the board. You'll definitely want to wear a helmet – and possibly other protective gear – while riding the MovPak, even if you're a fairly experienced skater. After all, the MovPak moves considerably faster than an ordinary skateboard does on flat ground. The MovPak as announced today is the latest in a string of iterations the Brazilian startup has created since May 2014. Although it has yet to even reach the general public, this latest version is lighter than previous prototypes, and includes a larger bag than earlier versions. It's also more powerful, includes the aforementioned charging capabilities and speaker/microphone combo, and has headlights for night cruising. You can preorder yours now for $599 through MovPak's IndieGoGo campaign; the company expects to ship the MovPak sometime this fall. At first glance, that price seems a little high. After all, you can get a complete skateboard from your local skate shop — along with a skatepack — for around $250 (about £173, AU$340) total. But in a world where electric skateboards from Boosted starts around $1,000 (about £692, AU$1,360), the MovPak isn't too badly priced. In time, I'd like to see MovPak offer some more basic models, and to become even more competitive in price. So ultimately, while the MovPak isn't the sort of thing you'd want to take to a skate park, for a certain class of commuter, it may make for an intriguing and convenient option.